Welcome! You've come to the right place where everything you need to buy or sell is at your finger tips. This site was created as a short cut to home buying or selling, whether you are an investor looking to purchase Multi-Family Apartments or a family wanting to relocate to the area. I specialize in Waterfront Properties, Farms, Residential and First Time Home Buyers. Over 92% of people start their search on the internet. On the GO Download my FREE MOBILE app. 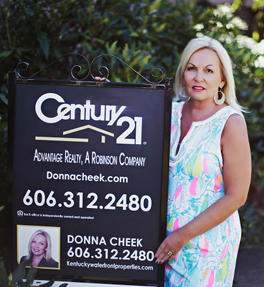 I'm Donna Cheek, 606-312-2480 direct text or call, with CENTURY 21 Advantage, located in South Eastern Kentucky. I am an experienced top producing agent in the London/Corbin Kentucky and Surrounding areas with 14 years Experience. I have achieved multiple sales awards including TOP Producer of 2015 of the area. Know what you're LOOKING for; email me a description, an area and a price range at donnacheek1@gmail.com and I will set you up with a custom search and NOTIFY you the second I locate it. I may have a pocket listing that's not on the web. I believe in extreme marketing to get your property sold! I will create a customized home tour of your property. I market on multiple websites including Zillow, Realtor.com, Trulia, Century 21, DonnaCheek.com, KentuckyWaterfrontProperties.com, YouTube, Facebook, Twitter, and Many More! If you're ready to buy or sell, LET'S get started with DonnaCheek.com! Know what you're LOOKING for; email me a description, an area and a price range at donnacheek1(at)gmail(dotted)com and I will set you up with a custom search and NOTIFY you the second I locate it. I may have a pocket listing that's not on the web. Download my mobile app to check the different listings in an area via GPS, or by searching the map!